This post is part of my personal challenge to bake my way through all the challenges of the Great British Bake Off. The challenge below is the signature challenge for week four (biscuits week) of series two: make 12 biscuits, combining unusual flavours. I always like it when the baking challenges are for bread as it’s nice to have a savoury option or three. Biscuits are admittedly much more fiddly and not really something I make on a day-to-day basis. In fact, there’s a reason I still haven’t attempted the showstopper part of the biscuit week challenge, macarons: it’s just something quite fiddly which requires patience, focus and diligence – three qualities which I try and apply to my day jobs but I am in increasingly short supply of elsewhere. So it was a pleasant surprise that the recipe I played around with was actually relatively simple, and despite using some intricate snowflake cutters and several components to sandwich together, it all actually came together relatively easily, even on a day when I was busy with other things. The key is to have your surfaces impeccably clean before starting and to have cleared enough counter space to roll out the biscuits. The signature bake challenge for this biscuit week was, simply, 12 biscuits. So far so simple – but they had to have an ‘unusual flavour combination’. I made these for a Christmas party which I throw every year (yes, I’m late writing up) so I wanted to use seasonal flavours. 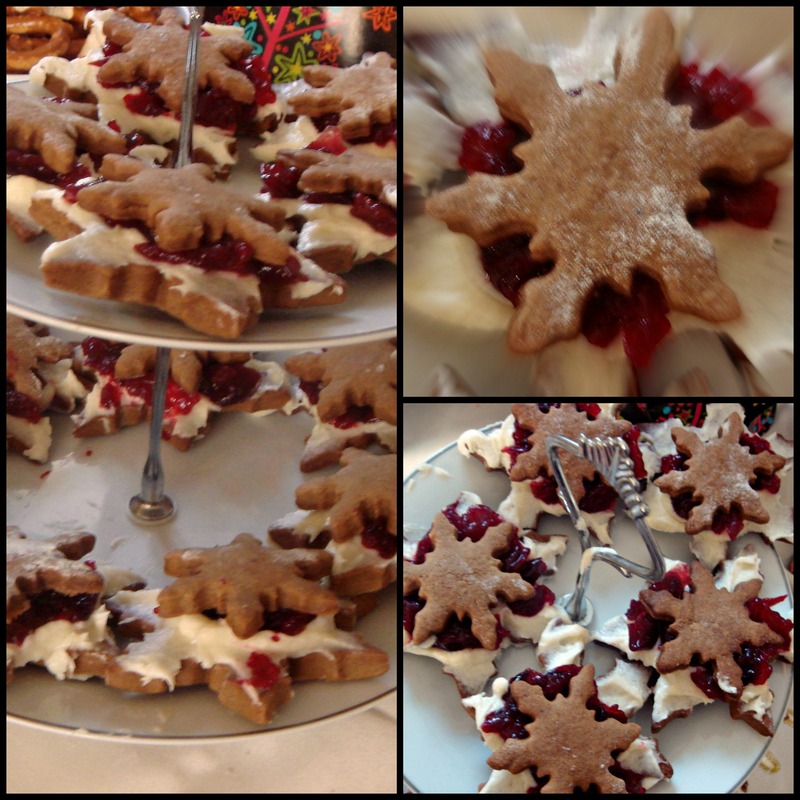 I’d made cranberry sauce for the first time in December and started thinking about matching it with spiced gingery biscuits – which naturally led me to pepparkakor, the essential Scandinavian Christmas biscuit. Something else was needed to pull it all together: soft, pudding-like vanilla frosting. And indeed the unusual contrast of crisp, warmly-spiced biscuit, sharp, citrus-laced cranberry sauce and almost bland, creamy icing worked very well together. Just a note: you will have frosting and cranberry sauce left over if you use the recipes below. The quantity of icing is not, in fairness, unmanageably enormous – fine for a little tray of cupcakes or a small layer cake. It might also freeze. And although I made the cranberry sauce a little sweeter than normal and flavoured it with orange so that the contrast between sweet and sour wasn’t excessively jarring, it was still fine for savoury applications, alongside meat or cheese. Although I made my own cranberry sauce, if you have any left over you could just grate in some orange zest and use that. Adapted from Diana Henry’s Roast Figs Sugar Snow. My version is a little spicier, darker and less floral. Cream together the butter and sugar (a mixer is best, I use a handheld) until light and fluffy. Add the milk and molasses and combine until smooth. Stir in all of the other ingredients and combine until smooth – you may need to bring the mixer together on low for this. Bring the dough together into a ball, kneading lightly. Pat the ball into two shallowish discs, wrap each in clingfilm, and refrigerate overnight. The next day, when ready to bake, preheat the oven to 180C. Remove the dough out from the fridge and roll out to 3mm thick (or, rather, thin, I guess!). This is easiest to do when the dough is still relatively cold – otherwise it melts everywhere and is too soft – though obviously it might be difficult if it is absolutely rock hard from the fridge. If so, take out 20 minutes before using. Stamp out your biscuits with the biscuit cutters of your desired shape. I used two snowflakes of different sizes, but you could use stars for a similar effect, or just circles for a simple, homey sandwich cookie. Place onto a greased metal baking sheet and bake for 8 minutes or so – a little more or little less maybe depending on the size of your biscuits. Remove from the oven and let cool on a wire rack. The biscuits will still seem quite soft when you remove them but will harden as they cool. This made a little over 24 biscuits of differing sizes for me. Combine the cranberries, sugar, water, and orange juice and zest in a small saucepan. Bring the mixture to the boil. Turn to medium and cook on medium for about three minutes. Turn the heat down to low and cook for 15 minutes, stirring frequently. You will hear and see the berries popping and the consistency will become thicker and jammier. Remove from the heat, given it a little taste and adjust with more sugar or orange as per your tastes. Leave to cool. Note: I adapted this frosting for the purposes of this particular recipe: I wanted something delicate with an old-fashioned, mild, milky taste to add a soothing note against the cranberry, rather than a rich recipe showcasing the floral intensity of vanilla or a very creamy and brightly-flavoured frosting, hence the adaptations below. If you follow the recipe on Baking Bites, it will be fluffier and stronger-tasting. If you’re using the leftovers I would recommend adding a little more vanilla extract to the leftover icing and perhaps a little icing sugar. Combine the milk, flour and salt in a saucepan and whisk until smooth (do not put on the heat while doing this). Cook over medium-high heat, whisking all the while, until the mixture thickens and comes to a boil. The original recipe suggests 5-7 minutes but it’s sometimes taken much longer or a little shorter to reach this step. Boil for 1 minute, then remove from the heat. Strain into a heatproof bowl and cover the surface with clingfilm to prevent a skin forming. Cool at room temperature for a few hours (I did this overnight). When the flour mixture is cool, beat together the butter, sugar and vanilla extract in a bowl until light and creamy. Add the cooled flour mixture (by now quite possibly a sad, grey and rubbery-looking thing), a heaping tablespoon at a time, beating in completely at each addition, until the frosting is creamy and light. Take your cooled biscuits. I recommend selecting your pairs at the start. If, like me, you went for a stacked effect with a bigger and smaller biscuit, assemble the base first. Take a larger biscuit as your base. Using a small, not-too-rigid offset spatula, smear a teaspoon or two of frosting on the base of the biscuit, taking it to the outer edges if you want to be generous or just inside the edges if you prefer neatness. You can build this up after adding the first layer if you want a little more frosting. Using a teaspoon, add a few blobs of cranberry sauce, to taste, to the centre of the biscuit, smoothing it outwards using the back of the spoon. Obviously, the amounts of frosting and cranberry sauce you dollop will depend on the size of your biscuits. Once satisfied, place the smaller biscuit on top. I positioned the snowflake arms of the top biscuit so that they overlapped the spaces between the arms of the bottom biscuit to give a petalled effect. This is as far as I go with food decoration! They are really pretty and unique!